Caster Semenya has opened up about her personal life in a sit down interview with rapper Proverb. 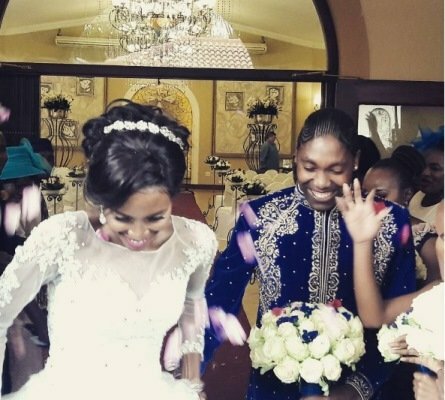 Gold medalist Caster Semenya has revealed that her first encounter with her wife Violet was very awkward. The athlete talked about the day they met on BET's 'Being Caster Semenya' special on Monday night. Caster says they bumped into each other in a restroom 10 years ago, and Violet thought she was a boy. "We met in a restroom in 2007. She was a runner and was being escorted by doping officials. She thought I was a boy and said, 'What is a boy doing in here?'" Caster recalled. Caster says she got defensive and immediately told her she was not a boy. "I'm not a boy. You think I'm lost? You think I can just walk in here?" she recalled saying. The awkward encounter did not stop the two women from getting to know each other, but Caster admits that it took some time before they started dating. She says she made the first move. "We were in denial. She had a past. She had a boyfriend... [She] was trying to deny being in love with a woman." Unlike Violet, Caster says she knew from a young age that she was a lesbian. "I always felt a bit different. When I'm with boys I feel comfortable. When I'm with girls I catch feelings. It's not anything I can control. Today I'm a powerhouse. They know I'm lesbian. They build you even if they think they are destroying you... I know how I look like. I know how I sound. I know how I walk... I'm just gonna be me. I do me and you do you," Caster said in reference to the hate she gets over her sexuality. Nearly a decade after they first met, Caster and Violet would get married in a beautiful white wedding ceremony. The 26-year-old says they hope to one day start a family.